We bought it 4 years ago. A potted plant, huge, healthy and in FULL BLOOM! Has never bloomed since! I never bother it when it dies down. I don't pull out the sticks or anything. Am so disappointed. It was a beautiful plant with coral colored blooms. Grows great, luscious, huge healthy bush.......but no blooms. Please help. 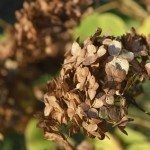 Is your hydrangea still in it's original pot? Most recommendations for a potted hydrangea call for at least a 5 gallon pot. Your plant my have to much nitrogen in the soil. This will cause lush green and no flowers. You need to add phosphorous. Bone Meal is a good way to do so.